That’d be Computer Gaming World magazine, aka Games For Windows magazine this past year and a half. I haven’t read the magazine in perhaps 8 years but I still feel awful to see its demise. Up until a few years ago I had 2 pride-and-joy collections stowed away in my parents’ garage – my boxes of old computer and video games magazines and a huge garbage bag full of Toronto rave fliers. The latter collection mysteriously vanished one day, thanks in no small part to the efforts of my indifferent parents, I’m sure. My boxes of magazines, however, I check on regularly. Before moving out of my parents house I used to read magazines all the time. I’d usually have a small stack of old PC Gamer magazines on the floor next to my bed for easy access every evening, with my shelf of about one third my back-issues at the foot of the bed, standing ready for bedtime reading replenishment. Since moving in with my girlfriend and getting married I haven’t made the time for magazines and have allowed all my subscriptions to lapse. I’ve had a lifelong infatuation with the English language and with computers, so these magazines epitomized my passions. I read for the content but I also studied the phrasing, the layouts, the neverending variety of ways an inferior product could be lambasted. I found particular columns and columnists I enjoyed reading and found myself unable to tear myself away from reviews of products I had no interest in just to see what, for example, Andy Mahood had to say about them. Most of all, I took solace the feeling that successful professionals based their careers around the hobby in which my parents saw little value (and now I work in IT, so neener neener). The first computer games magazine I bought religiously (though never thought to save money by subscribing) was Computer Gaming World. This was a magazine geared toward a great variety of audiences, from gamers to store owners to investors to play-by-mail strategy enthusiasts. Never again was there a single publication that gave so many games-related audiences a glimpse into eachothers’ oeuvre. I read CGW from the early to late-90’s and, as far as I know, have proudly squirreled away every single ish. 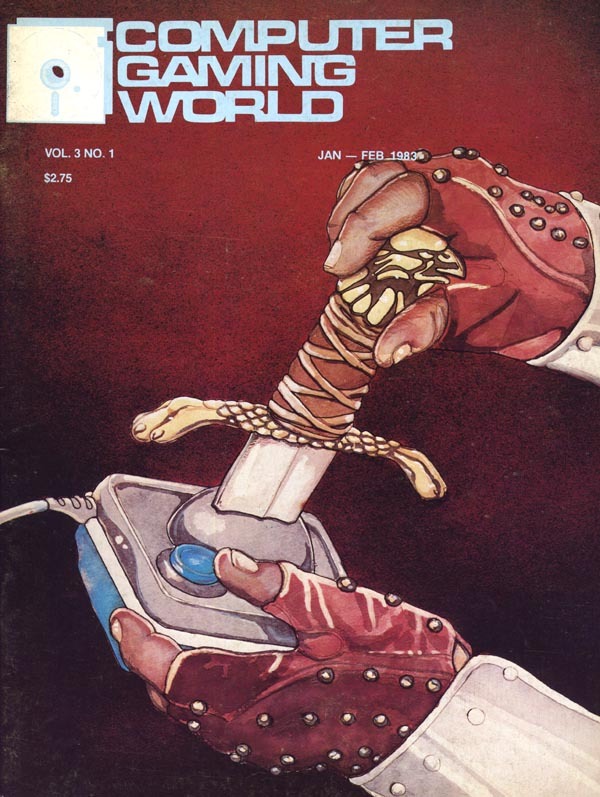 The magazine was renowned for paying lip service by means of a single paragraph synopsis to no fewer than 70 or 80 games every single month, followed by insider editorials, game strategies, and company profiles. The pièce de résistance of CGW was its authoritative top-100 list, replete with breakdowns per-category, reflecting reader poll opinions. This is the page I turned to first, usually before even leaving the store. This was my personal monthly Oscar. Would Lucasarts’ new adventure game beat out Sierra’s? How many Maxis games would make the cut this month? Would Wing Commander and its sequel hog twin top-10 spots yet again, or would that sneaky X-Wing steal their thunder? A large scan of the dual-page CGW Top 100. Can you guess the year? Back in the early-to-mid 90s, during the veritable golden age of PC games, there was a glut of magazines dedicated to the hobby and specific platform. I bought and collected as much as I could afford, from the short-lived PC Games and Computer Entertainment (which later came bundled with a second magazine for CD-ROM “multimedia” gaming) to the free InterAction magazine published by Sierra (which was perhaps the only publication to speak favourably of the company’s flopped RTS Outpost). My funds limited my choices later on so I said what would apparently be my final goodbye to Computer Gaming World in favour of PC Gamer magazine whose more playful and review-centric editorial voice I’d grown to identify with. CGW continued on without me for many years, coming to an end in 2006 when it was rebranded “Games For Windows” (ouch). I picked up a single issue of GFW and only liked about half of it – much content seemed to me like a “Swimsuit Edition” of testosterone-pandering pap – but the reviews and editorials were as astute and cutting as I’d ever read. Parent company Ziff Davis filed for Chapter 11 recently, vowing to restructure to recoup losses and that it would remain a profitable company. Lo, after a good 27 years, the printed magazine is now kaput. Nearly all the staff (minus the layout designers) will remain with 1UP, which is a brand I respect. In truth I will surely read much more of this team’s work now that it’s available for free online on the soon-to-be-redesigned 1UP PC portal. I wish the chaps at the former CGW/GFW absolutely nothing but the best. The good news is that all is not lost. An incredible legacy of hard work, passionate writing, gorgeous designs, and mind boggling cover art is all available, free of charge and ads, at the CGW Museum website. I recently donated $20 to the site who kindly sent me a DVD of as many issues as they’d scanned at the time – spanning from the first issue to about 1993. It seems they’ve now filled out the archive to include every issue until the CGW name was retired. The scans are immaculate and OCRed which makes them fully searchable. It’s a popular site and each issue is around 60MB so if you’ve enjoyed the magazine as much as I have you should consider flipping them a few bucks for a DVD to save time and bandwidth. For me personally, the closing of Games for Windows: The Official Magazine is not just a business decision (though, obviously it’s exactly that in reality), but feels more akin, in fact, to the passing of a loved one. Drama much? Well, you can scoff if you want, but the fact of the matter is that I have poured my heart and soul into this magazine, month after month after month, for over 10 years now. Every four weeks for 10 years I have done my best to get a quality magazine out the door, and the fact that I don’t have that deadline now is not in any way, despite the temptation to go for gallows humor, a source of relief. It feels like a giant gaping hole in my life. This is a blog. 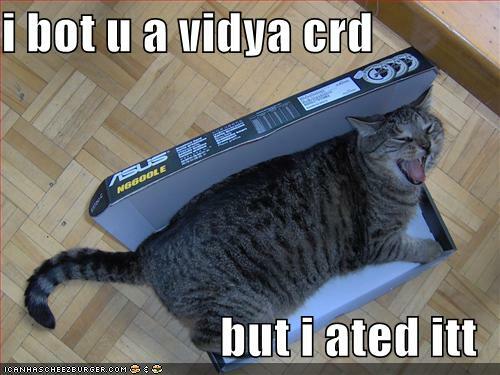 It’s compulsory that I post a lolcat at some point. Let’s just do this thing and get it over with. Special thanks to Chrystal for being a character, and to icanhascheezburger for their awesome lolcat generator applet. The heyday of cutesy internet personality tests has come and gone, but I still enjoy taking The Political Compass test every few months. Normally I take such a test once and stick a fork in it, but for the most part I’m politically naive, and my wife is a politics junkie with me cursed as her closest pair of ears so my various political opinions and motivations change rapidly as she challenges me. 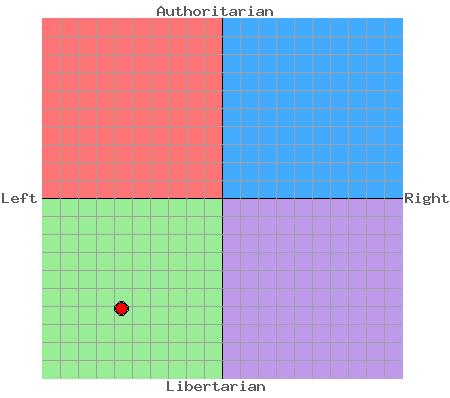 To my surprise I am just as libertarian as ever before, but have edged significantly closer to centre since my last test (which put me at about -7.50 to the left as I recall). This classifies me as politically compatible with the Dalai Lama and Nelson Mandela, though I’m even further southwest than those radical luminaries. I have a love/hate relationship with the Political Compass test. Every time I take the test I become more aware of how ambiguously phrased the questions are, and find a new excuse to answer a question in a completely new way based on an unspecified exception. This is quite brilliant because, I suppose, the means classify your political slant more than the ends do. For example, one question is phrased “mothers may have careers, but their first duty is to be homemakers.” I answered this question with “Agree”, and my wife answered it “Strongly Disagree”. We both disagree with the phrasing assuming it is exhaustive – we both disagree that a woman’s place is in the home, barefoot and pregnant. However, I don’t see the phrasing as exhaustive and I believe a husband’s first duty is to his home and family which is why I answered the way I did. We’re both correct, yes? I urge one and all to take this test to see a summary of your political position based on your opinions of specific scenarios and morals. You might be surprised with the outcome.